Shortly after this massacre there was a large march, one of the largest in French history, to show that people of that country and of the world would not stand for this threat to freedom of speech, which was considered inviolable. Many world leaders were present in the front row of the march to show how highly they valued the freedom to say anything no matter how controversial or offensive. Other leaders spoke directly to support the marchers and freedom of speech, such as the leaders of Saudi Arabia — where a journalist is receiving 50 lashes a day for criticising the government, whose leader just died and President Obama made haste to Saudi Arabia to show his condolences — and Egypt — which currently imprisons three journalists for Al Jezeera, whom they consider to “pro-Muslim”, and whose country gets one of the greatest shows of military support from the United States. Leading the March was the President of France, a country that shortly thereafter imprisoned someone for “glorifying terrorism”. This is a country where denying the Holocaust can result in a prison sentence. France has a checkered history with Jews. After Jewish people were allowed full freedoms during the French Revolution, and Catholics were not treated as highly as they had come to expect (several popes lived in France for awhile), anti-Semitism arose again under the French, as shown in the Dreyfus Affair of the 1890’s, where Alfred Dreyfus was wrongly accused of treason, and during World War II when France sent many Jews to Nazi death camps. After the attack France cracked down of hate speech, speech glorifying terrorism, and anti-semitic speech. I’m surprised no one’s head exploded at the contradictions. It seems freedom of speech is only acceptable if a marginalize people is being attacked. One wonders if offensive cartoons about black people were published in a major magazine in the United States if the Congress would support that publication, or if MSNBC and Fox would agree that that was a good thing showing how expansive is the freedom Americans enjoys. We have a fairly exact time for the attack and so we can do an exact chart; I don’t have a chart for the founding of Paris so we will look at just the event chart. The first chart is at the time of the event. 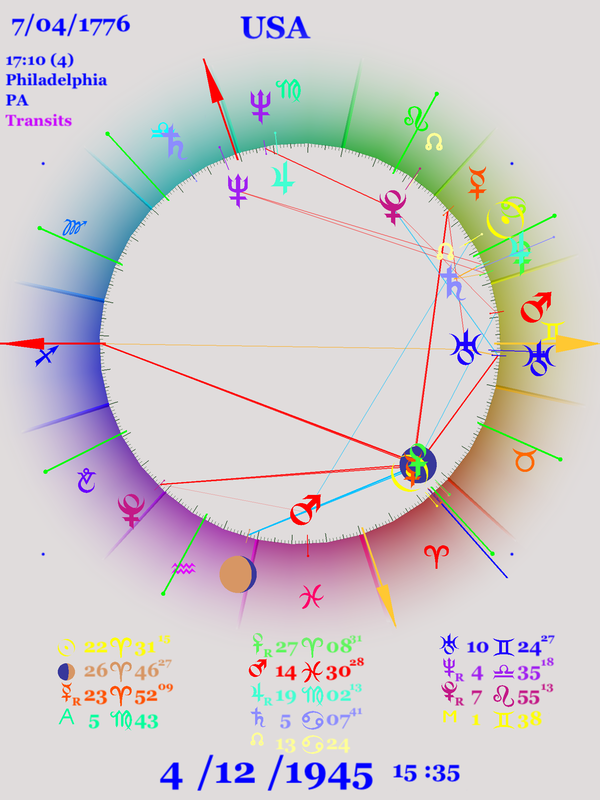 In this chart we see that the tightest aspect is Mars sextile Midheaven, suggesting something involving gunfire (Mars) will be noted by the world. Also tight is Sun semisquare Saturn, suggesting disappointment or limitations. Mars is opposite Jupiter by a wide orb, and suggests much (Jupiter) gunfire (Mars). 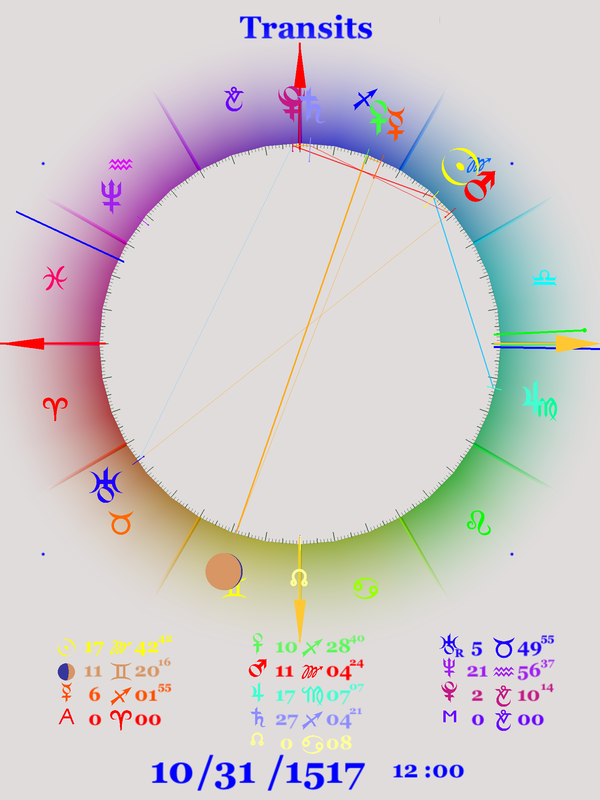 Sun is conjunct Pluto, suggesting Plutonian events on that day. Another aspect is Moon sesquiquadrate the MC, suggesting that the public will know what happened at that hour. Finally, let us not forget that the overriding aspect of this period is the Uranus square Pluto — change, revolution. Let’s look at the fourth harmonic chart, which shows squares, opposition, and conjunctions as conjunctions. The most prominent aspect is Sun opposite Saturn which is very tight. This is the same as the semisquare between those two planets we saw in the first harmonic chart. We can see how wide that Mars-Jupiter opposition is by noticing that the conjunction of those two planets in the fourth harmonic chart is very wide, whereas the Uranus-Pluto conjunction (square in the first harmonic chart) is very tight. We also notice something not apparent in the first harmonic chart, a tight square between Pluto and the Ascendant. This is an aspect of 67.5° in the first harmonic chart, a hard aspect. Also notable is the Mercury-Mars square (extremely tight), perhaps gunfire at a newspaper office. 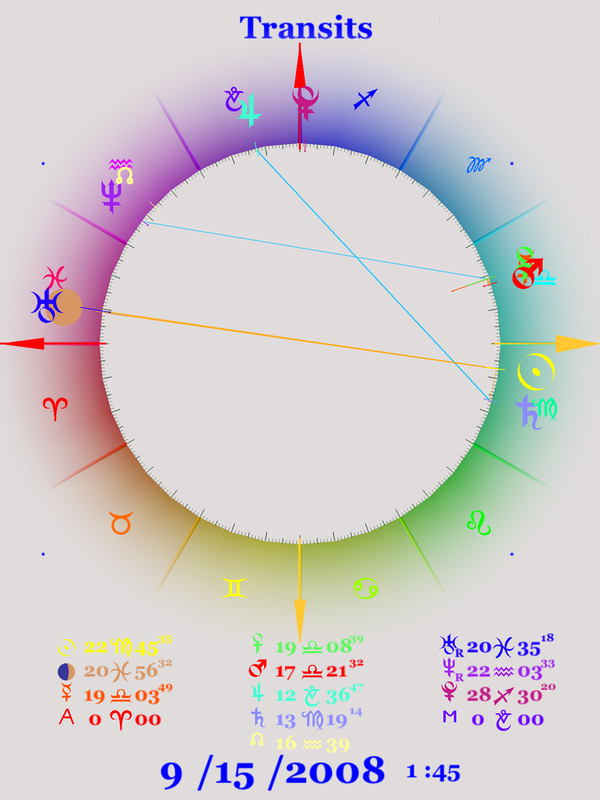 This final chart shows the midpoints in the fourth harmonic, which is the same as the traditional 90-degree dial used in German schools of astrology. We see that Pluto is at the midpoint of three pairs of planets, and the midpoint Pluto = Mars/Jupiter is exact. Ebertin says about this midpoint “a great loss”. Another tight midpoint is Midheaven = Sun/Neptune for which Ebertin says “A negative outlook” which is certainly something we’ve seen in the world after this terrible event. From looking at these three charts of the same moment, the overriding conclusion is that Pluto is by far the dominant planet. This was indeed a Plutonian event, happening during an important Pluto aspect and we can expect other things to follow. Picking the best and at times the worst of presidents is an endless contest. In most lists, the best presidents of the United States are Abraham Lincoln, the sixteenth President, and Franklin Roosevelt, the thirty second President — both Aquarians. Both are considered the top two Presidents, in no particular order. But both made an extremely bad decision, which no one credits them with, that were among the worst presidential decisions every, and the results of which we still live with. During his first term, Lincoln’s Vice President was Hannibal Hamlin. Hamlin was a radical Republican who fully supported the abolishment of slavery. He was replaced in the second election by a Democrat from the border state of Tennessee and they ran on, instead of the Republican Party ticket, a new party formed for that election only called the National Union Party; the idea was to show that the Democrats and Republicans were united and that the Civil War was a bipartisan effort. Unfortunately, Lincoln was assassinated shortly after the election of 1864, which the National Union Party won. Lincoln’s chosen vice president was Andrew Johnson, a Democratic Senator who still supported the Union, even though Tennessee had joined the Confederate States. It was for that reason that Lincoln decided to have him on the ticket of the new union party that was set up just for the election of 1864. By early 1865 the South had lost the Civil War, and Lincoln had been assassinated, so Johnson was the new President. Johnson had given a bad impression when he had shown up for his inaugural as vice president drunk, but as Lincoln had explained, that was only because he was so nervous. Johnson was never a friend to black people, either when they were slaves or after the War ended. The period between the end of the war and 1876 was called Reconstruction; the South was suppose to re-enter the Union and the freed blacks who had formerly been slaves were to have been brought into full-fledged citizens of the United States. To say that Reconstruction was unsuccessful would be an understatement, and we are still living with the consequences of that period. The so-called Black Codes were soon passed in the South, which restricted the freedom of the newly freed slaves. While there were more Blacks elected to the Congress during Reconstruction than ever since, few long lasting changes were made and after the end of Reconstruction the South tried to revert as closely as possible to the antebellum ways of treating their black citizens. Andrew Johnson did not help Reconstruction, and he so angered the Radical Republicans in Congress that they passed a law so that Johnson would break it and they would have an excuse to impeach him, and they did. Johnson goes down in history as the first President to be impeached; he was not convicted, but after that his frosty relations with Congress did not improve. Reconstruction ended in 1876, even thought it had not been finished. What happened was the election of 1876. That was a interesting year in the United States. It was the centennial of the founding of the country, and there was much celebration on the Fourth of July, a special birthday. Just a few days before that party a civil war veteran named George Armstrong Custer had been killed fighting Indians and the news had just reached the East. The current President, Ulysses Grant, who had accepted the South’s surrender in the Civil War, was very unpopular. The election that November was disputed, and in fact was more controversial than the recent election of 2000 and Bush v Gore. It was seemingly won by the Democrat Samuel Tilden and the Republican Rutheford Hayes lost. But in several states both the Republicans and Democrats turned in electoral college votes, which disagreed. Eventually a committee was formed consisting of members of the Senate, House, and Supreme Court. The committee was suppose to choose between the disputed electoral votes. As a result, the Republican was chosen, but the Democrats, who were the party in the South of white people, also got something that they wanted: a removal of troops in the South and thus an end to Reconstruction. The whites in the South could go back to interfering with the newly freed slaves with no interference from the Army. The new President was referred to a Ruthefraud Hayes after that election. The first thing we look at in this assassination chart is the position of Mars, that indicates gunshots. Since we have a time, the position of the Moon is valid, and it is opposite the US Mars. 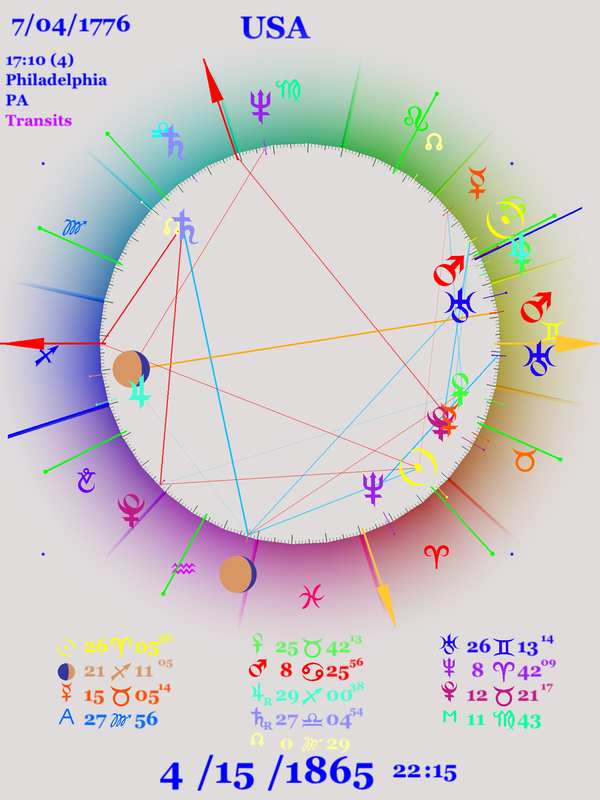 Transiting Mars is on the cusp of the eight house (the long dark blue line extending out from that planet indicates this) which in traditional astrology is the house of death. Mars is within the core of the US chart — Sun, Venus, Jupiter — and approaching an exact conjunction with the Sun. Mercury is sesquiquadrate the Midheaven, and the news of this event was communicated rapidly, besides taking place within a theater. Saturn, depression, is aspecting the Moon, Pluto, and the Ascendant of the US chart. Franklin Delano Roosevelt had an unprecedented four terms. In fact, the twenty second amendment to the US Constitution was passed to prevent this from happening again. In his third term, Roosevelt had as Vice President Henry Wallace, who had been Secretary of Agriculture during the first two terms and an important supporter of the New Deal. Wallace was an American original. He was a farmer from Iowa whose political beliefs were out of step with the Washington Establishment. He was also someone who had esoteric beliefs that were out of place in Washington. In fact, it was his idea to put the eye on the pyramid on the back of a dollar bill. This corresponds directly to something in the astrological birth chart of the United States, as we will discuss at some other time. Not only was he FDR’s Vice President in his third term, he was also Roosevelt’s choice for the fourth term. But by that time Roosevelt was noticeably sick, and the Democratic Party officials knew he wouldn’t last for four more years, so they knew that whoever was vice president would become President, and they wanted someone in that position that they could control, and they did not want that person to be someone with the maverick ideas of a Henry Wallace. They convinced FDR to nominate Harry Truman, who had supported New Deal policies and was also from the Midwest, but was not an independent thinker and could be trusted to take orders. Some people called him a hack, and his start in politics was the result of action by a local political organization called the Pendergast machine. But the convention, which was heavily in favor of Wallace, would have selected him anyway, except the power in the convention hall failed conveniently and the selection was put off to the next day. While Wallace really supported FDR’s policies, especially in regards to the Soviet Union, and he had been in the Roosevelt cabinet since the first election, Truman did not support the Roosevelt foreign policy and was strongly influenced by such people as his Secretary of State, James Byrnes. As a result, Truman was in charge of ordering the atomic bombs dropped on Japan, and he took a tough policy towards the Soviet Union after the war ended and ignored the agreements made at Yalta. He helped bring the policy of anti-communism to America, which led to McCarthyism, and helped bring the Cold War with his Truman Doctrine. Conservatives and liberals did not like Wallace at all, and this belief still exists. I recently saw an article in the New Yorker from last year defaming Henry Wallace. But if Wallace had served as President after the war, the Cold War would have had much less chance of happening, and the future of the world would have been considerably different. Truman brought in the National Security State, which has only gotten stronger after 9/11. As discussed previously the beginnings of the NSS changed America’s path and position in the world. Even though the Cold War is over, the Cold War tendencies to mistrust the Russians are still in full force in America, and has led to a second Cold War and the accompanying danger of nuclear war. In this chart we have a conjunction of four planets in Aries — Sun, Moon, Mercury, and Venus — and a new Moon had happened eight hours earlier. This quadruple conjunction is aspecting much of the chart: Moon, Pluto, Ascendant, Uranus, Mercury, and Mars. Saturn is approaching the core planets of the United States: the government will be depressed, and there were many changes to the government in the next three months it took Saturn to cross the Sun. In fact, Saturn was exactly on the Sun of the US on July 4, 1945. These three events appear to have nothing in common, except that that all shook the foundations of the world. But they did have something in common in terms of symbolic meaning. I will discuss these three events and show the commonality. It is of course difficult to get exact timing of these three events, but we only know when they were under way, that is, shortly after they started. “The Great Recession” is now commonly used to refer to the economic meltdown, or whatever you want to call it, that happened in the period 2007-2009. It wasn’t as bad as the Great Depression, but it was, and still is for many people, worse than anything else they experienced in their lifetime, thus the term The Great Recession. The most commonly used event as a marker for the Great Recession, but not the only one, is the fall of the Lehman Brothers Bank on September 15, 2008. But the housing bubble that had been growing, in the United States as well as other countries such as Ireland and Spain, burst in the middle of 2007 and the recession is said to have bottomed out in the middle of 2009, so at the very least we can considered the event to have happened 2007 to 2009. On October 9, 2007 the Dow reached a record high of 14,164 which it would not see again for several years. The meltdown is considered to have started on August 9, 2007, but that is only obvious in hindsight. 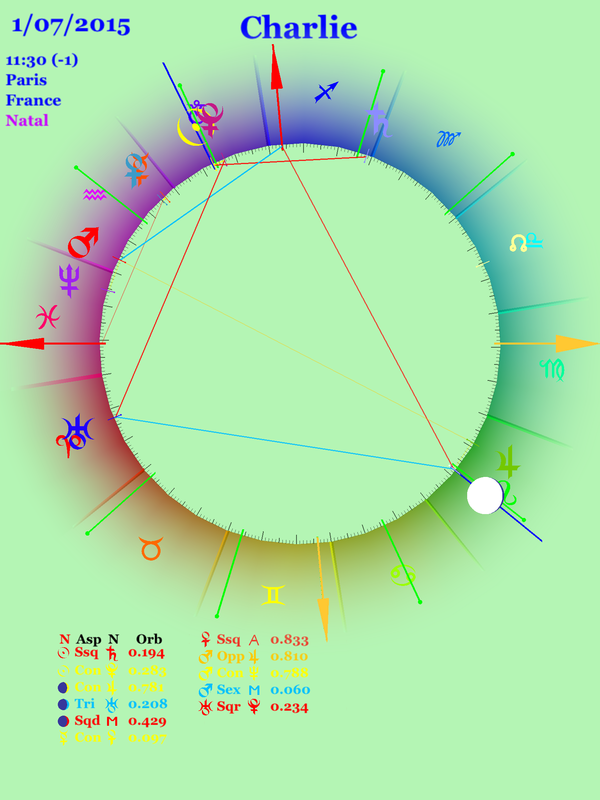 Looking at the first chart for September 15, 2008 we see that Pluto is very near to 0 Capricorn, having crossed it the first time this cycle in January of the same year. It was near the cardinal point through 2007, 2008, and 2009. Since this is the crossing of the cardinal axis, I consider it an important event, more important than the Great Depression of the Thirties, which is commonly said to have started in 1929. We are regaled weekly by now that the Recovery has happened, that the Great Recession is so far removed in time, and that the economy is doing so well, that we should forget about it. But for the great majority of people, the good times have not returned, if the times before 2007 could be considered “good” for many people in the United States. Even though the unemployment rate in the US has fallen, many people have dropped out of the job market, and thus are not classified as unemployed, and the wages of the new jobs are much less that of the old jobs lost in the Great Recession. And it appears that Europe will soon witness its third dip in GDP since the Great Recession, Japan is having problems, and the economic news from China is not as rosy as it was a few years ago. In the United States one of the main effects of the Great Recession was to transfer more money to the really wealthy, so that now the top one percent of the population makes more than 25% of the national income, a figure that has risen over the last decade. The effects of this so-called Great Recession will be with the world for a long time. And in 2015 many people, but not government officials, are predicting bad economic times ahead. People are waiting for the other shoe to drop. The price of a barrel of oil has dropped to almost half of what it was a year ago, and many countries and businesses are expected to take a hit. The next three months see the last of the Uranus-Pluto square, and the square is tight for the entire period. The rise of England to be the world power changed much for the next 150 years. England had many colonies in all parts of the world, including one that was lost shortly after they became top dog, and maintained those colonies at least until the end of World War Two, almost 200 years later. The history of a large and increasingly important country, India, was influenced strongly by England and its policies there, including the dominance of the Hindu people, who worked well with the British, over the Muslim people. Winston Churchill, the British Prime Minister during World War Two, strongly influenced world and United States policy in those years, including the formation of the Cold War, even though Britain was no longer the most powerful nation. And the list goes on. The dominance of England after the Seven Years War strongly influenced the world as we know it now, it ways great and small. 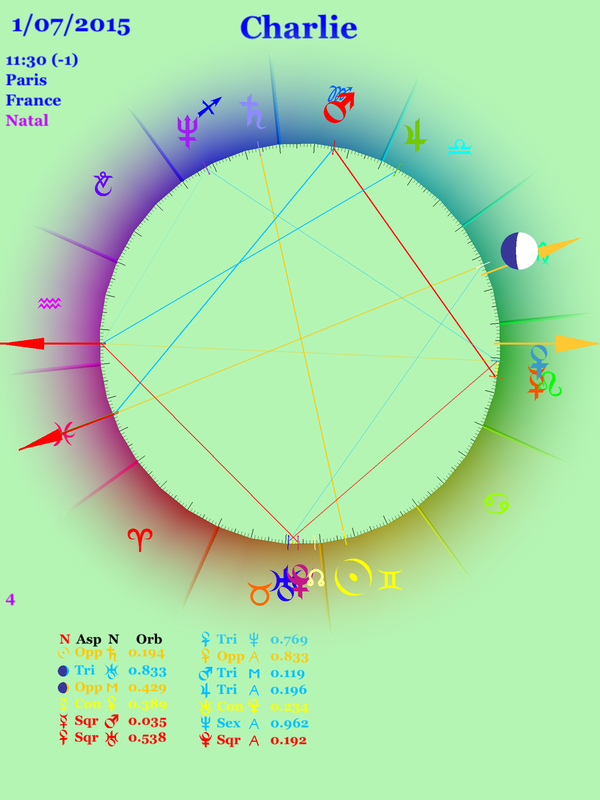 The chart for the signing of the Treaty of Paris show Pluto just three degrees past the 0 Capricorn cardinal axis. It had been passing back and forth over 0 Capricorn during the Seven Years War. This was about 250 years before the Great Recession start, and thus just one Pluto cycle previously. And what about the Reformation? There were several movements in that direction earlier, and dissatisfaction with the Roman Church, which at that time was the only type of Christianity known since all apostolic forms had been long banished, but in general the date for the Protestant Reformation is assigned to October 31, 1517, when Martin Luther supposedly nailed his Ninety-Fives Theses to the door of the All Saints’ Church in Wittenburg, Germany (Prussia). Of course, the ideas contained in those theses had long been percolating in the mind of Martin Luther. To say that this is a major event for the world would be an understatement. There were battles in Europe between the newly-formed Protestants and the Catholics, culminating in the very bloody Thirty Years War that decimated Germany. (Some think the current conflict between the Shias and the Sunnis is the Islamic equivalent of that war.) And of course there is evangelical Protestantism that has spread into parts of the world such as Latin America and Africa and is in competition with Catholicism or Islam in those areas. America was founded by Protestants and for a long time “Catholic” was a dirty word in that country. In the chart for October 31, 1517 we again see Pluto has just crossed the Cardinal axis at 0 Capricorn. This is again just one Pluto cycle before the previous event, and two Pluto cycles before the Great Recession discussed first. Again, the state of the world was changed, for good and bad, and we still live with the consequences of that event, the Reformation.